Ms. Hardiman used Kahoot! with her students as a test review tool. The kids were completely into the game and learning at the same time! With Kahoot! teachers and students can create and play quizzes, discussions or even surveys using any device with a web browser… including a laptop, iPad, iPhone, iPod, Android, Chromebook, Windows Phone or PC and more. Google Classroom is an awesome new resource for teachers, especially those in 1:1 or BYOD school like Elkmont. Ms. Horton, Ms. English & Ms. McMunn have bravely moved forward with learning Google Classroom & Google Drive and getting their students set up using their LCS GAFE account and connecting them to Google Classroom. The kids loved that they could carry on a conversation with their teacher in real time using the comments feature in Google. Students were also amazed that their teacher could see what they were typing! For teachers using Google Classroom there is no more papers without names, "I forgot bring my homework", "The dog ate my homework", etc. Teachers can see in real time their students progression throughout an assignment. Google Classroom is the ultimate formative assessment tool and relationship builder for teachers. The Mathematics Department, Ms. Holt & Ms. McMunn tackled Khan Academy this week. For teachers, there is never any question as to how your students are progressing in math with Khan Academy. Once you become a coach in Khan Academy, teachers and coaches can access all of their students' data. You can get a summary of class performance as a whole or dive into a particular student's profile to figure out exactly which topics are problematic. The coach reports let coaches glance at their dashboard and quickly figure out how to best spend their time teaching. Khan Academy provides teachers with constant, real time feedback as to student progress which is a perfect formative assessment tool for the mathematics classroom. Below are some introductory videos to both Google Classroom and Khan Academy. If you would like to get started with either of these technologies in your classroom please contact Ms. Nikki D Robertson to book a day and time. On Monday, September 15, 2014 Elkmont High School made their global mark by participating in International Dot Day. Ms. Tessa Hardiman's 5th grade classes participated in several different activities for Dot Day, but the activity they loved the most was connecting with other students around the country who were celebrating Dot Day too! Using Skype and Google Hangouts, students from Alabama, Georgia and New Jersey connected and shared information about what makes their school and town awesome. It was exciting to watch as these kids connected, shared, learned and grew together during our Dot Day activities. One really fun thing we did using Skype was Mystery Skype. Mystery Skype is a 45-60 minute critical thinking challenge that your class takes part in while Skyping with another class somewhere else in the world. Your students' goal is to guess the other school's location (country, state, city, school name) before they guess yours. Learn more about Mystery Skype and other ways you can use Skype in the Classroom click HERE. In addition to our fun with Skype, students also made Dot Day Trading Cards and recorded their dots using FlipGrid. 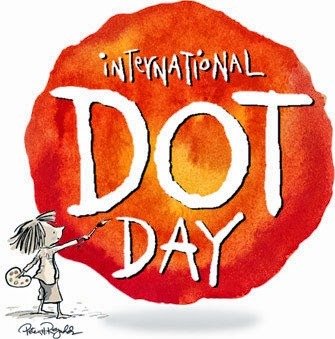 Learn more about our Dot Day activities HERE. Mary Jane Hobbs empowered her students to become masters of their own learning this week by introducing them to Khan Academy. Khan Academy enables students to practice math at your own pace with our adaptive assessment environment. You can start at 1 + 1 and work your way into calculus or jump right into whatever topic needs some brushing up. Teachers and coaches can access all of their students' data. You can get a summary of class performance as a whole or dive into a particular student's profile to figure out exactly which topics are problematic. The coach reports let coaches glance at their dashboard and quickly figure out how to best spend their time teaching. Ms. Hobbs also got her students started on Google Classroom and Google Drive. Students no longer have to worry about losing a USB Stick, not being able to access an assignment because it is on their computer at home, etc. Classroom is available to anyone with Google Apps for Education, a free suite of productivity tools including Gmail, Docs, and Drive. Ms. Missy Bailey's 5th grade students embraced the power of collaboration using Google Slides to work on their Project Based Learning presentation. The kids were so excited as they worked on groups on their MacBooks but on the same Google Slides. It was exhilarating to watch Ms. Bailey's students as they shared, talked, engaged and produced their PBL slides in Google. One of my professional goals is to help teachers use technology as an efficient and effective tool for student learning instead of using it as an add on to the end of a traditional unit of study. Google Drive tools are well-suited for use as a starting point to help teachers begin to break the barriers of traditional methods of tech integration and design student driven learning experiences that require students to construct knowledge as they create, an idea supported by the Common Core State Standards (CCSS). The features available in Google Slides make it a useful tool for helping students begin to develop digital literacy and engage in the types of learning experiences suggested by the Common Core. With Google Drive tools like Slides, technology and research are seamlessly integrated into the learning process as students are engaged in problem solving, critical thinking, communication and creativity. One great thing about technology is the ability to learn anytime anyplace...even in your PJs! Elkmont High School's Instructional Technology Facilitator, Nikki D Robertson, has been creating video tutorials for technologies taught to teachers and students. Additionally, Ms. Robertson offers this service for other technologies that teachers or students would like to learn. Watch our list of video tutorial resources to grow through out the school year HERE. TL Virtual Cafe: Back To School Special - I always look forward to the beginning of a new season of TL Virtual Cafe. I love that this awesome community gives everyone the opportunity to have a voice. Be brave this year. Step forward, out of the stack and share with somebody, anybody, something great that you do in your library. The more we share our story the more the public perception of libraries and librarian will change to a positive one. #TLChat LIVE! 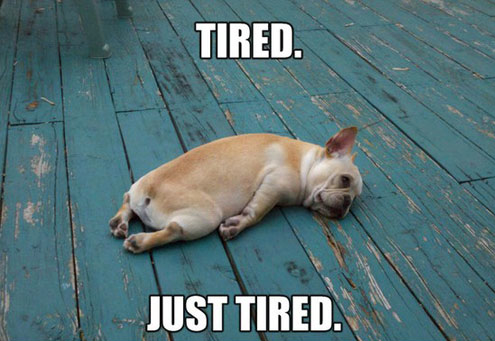 Season Two- Season Two of #TLChat LIVE! tackled the topic of MakerSpaces in the Library. The conversation was lively and the ideas shared provide all with something to take back to their schools to try. #GlobalTL: Librarians Without Borders- A Joyce Valenza production, #GlobalTL kicked off it's inaugural broadcast Thursday, September 18th with an all-star lineup of guests. A great conversation regarding connecting, collaborating and librarians role in helping teachers with this took place. If you missed the live broadcast you can watch a recording of the show below. 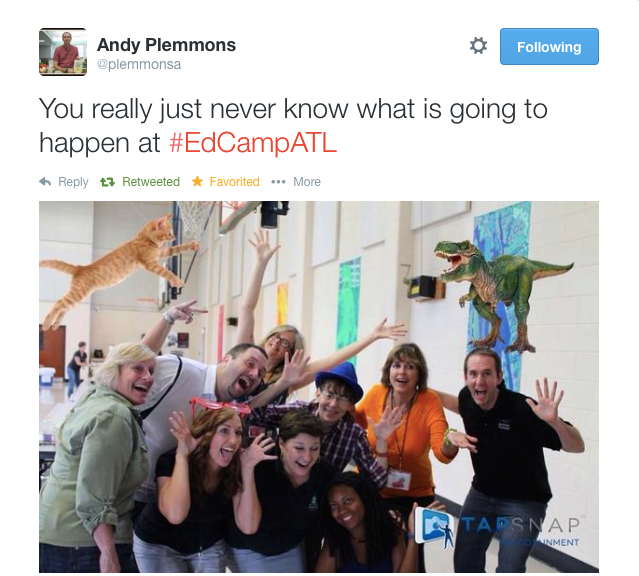 EdCamp Atlanta: You Never Know What Will Happen! The point of an EdCamp event is for it to be completely separated from any and all association with a school/district so that teachers can get outside of the school/district bubble and be exposed to new or different educational pedagogies. There should also be NO sessions or presenters planned in advance. The point it to be completely participant driven.